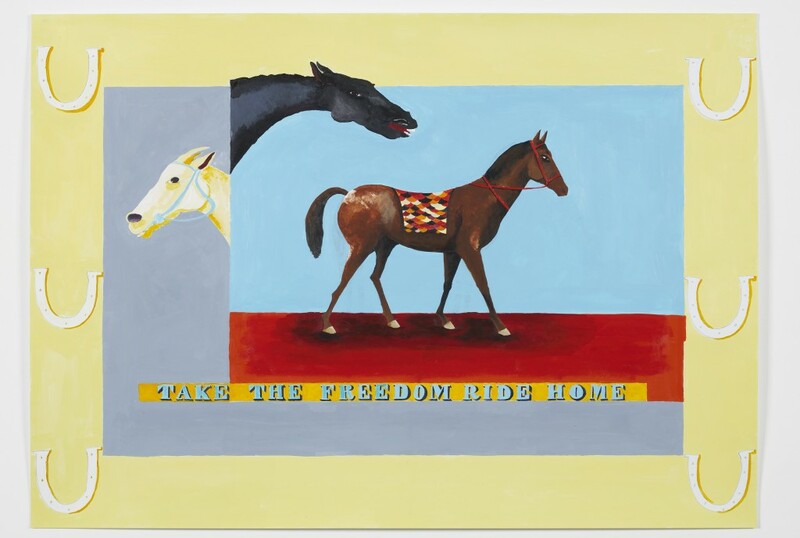 One of Lubaina Himid’s seminal bodies of work is her Kangas from the Lost Sample Book (2011–12). As with the typical kanga fabrics that one can find in markets all over east Africa, Himid’s kangas are emblazoned with evocative and inspirational slogans of her own creation. As kanga designs carried out on paper, Himid’s works speak to intersecting concerns, including both the failing textile industry in Britain—the bedrock of the industrial revolution and earlier forms of globalization—and identity and personal styling, since kangas are most often associated with women’s attire. There are many other associated meanings embedded in these textiles, for instance stories of migration, loss, and impermanence. Lubaina Himid’s newest series of kangas speak powerfully to a nexus between the intimate and the political, the global and the local. Produced for the 10th Berlin Biennale, the nine works that make up the series On the Night of the Full Moon (2018) are dedicated to the writings of poets Audre Lorde, Maud Sulter, and Essex Hemphill, and include excerpts from their works. Accompanying the kanga images are spoken recordings of selected poems by these writers. As a form of memorialization, her work brings us into dialogue with our varied pasts and offers a way of speaking back to history rather than being its unwitting subjects.